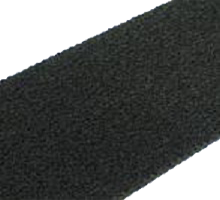 VELCRO® Brand VELSTRETCH® Elastic Loop was made for applications that require the closure to expand and contract. This loop tape is designed to provide about 55% stretch and has a moderate to high cycle life. Designed with a plush backing it can be used for countless applications where comfort is desired. Standard stock colors are: White, Black & Beige. All rolls are 40 yards in length. 3/4" is available on Black & Royal Blue only.